This is a very misleading recipe title. Baking artichokes is not a fast process. They bake for an hour. But the prep is fast (I swear). While shopping at Whole Foods (Whole Paycheck, har har) tonight I saw the chokes and just had to buy one. 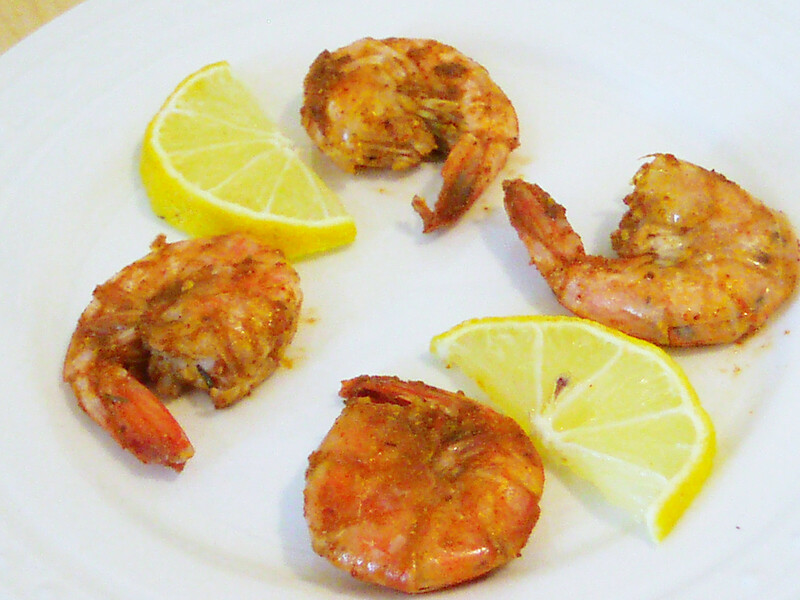 I whipped this snack up quickly while catching up on my blogs. The best part is that the artichoke will save well in a plastic baggy in the fridge over the weekend for extended snacking. Preheat the oven to 425º Fahrenheit. Cut about 1 inch off the top with a sharp knife, and be careful not to catch your fingers on the spines of the leaves. Discard the tops of the leaves. 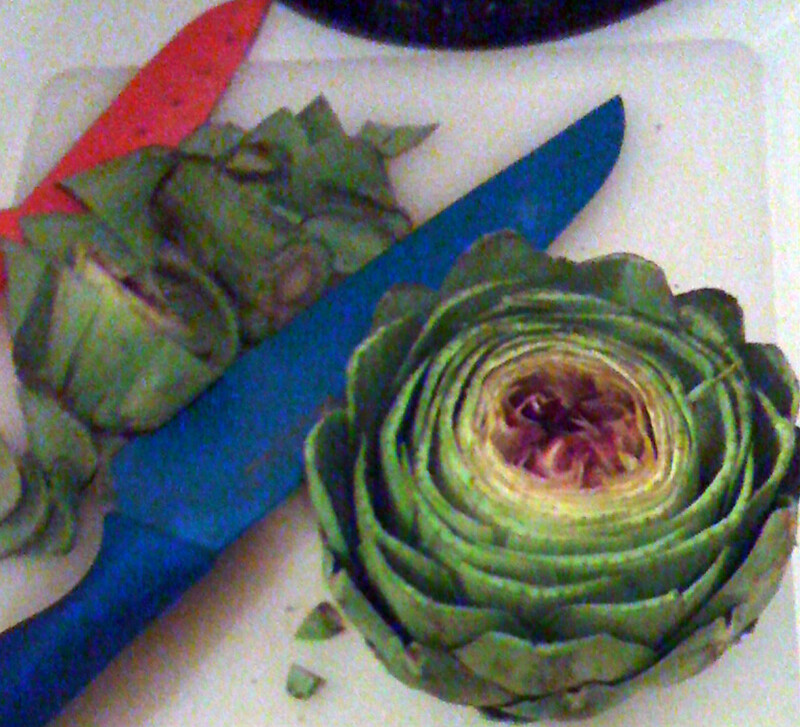 Cut off the stem so that the artichoke can sit upright. Using your hands spread open the leaves a little bit. Drizzle the olive oil across the top of the artichoke to get it in between the leaves. Sprinkle the seasoning throughout, trying to get it in between the leaves. Wrap the artichoke in two layers of aluminum foil and place on a baking sheet upright. Enjoy the tasty bits from the bottom of the leaves and the heart! It snowed in DC last night. The only reason I know this is because Eric Fisher, the cute meteorologist on the Weather Channel, told me so. I am relieved that the snow fell I was sleeping and melted before I left the apartment, because flurries would have made going to the farmer’s market this morning god-awful. Ben’s theme this week is “there is wine in my food!” The only bottle I have around is a REALLY nice bottle of Cabernet Sauvignon that is categorically NOT cooking wine. So I’ve taken liberties and decided to make a recipe using wine vinegar, because that’s like wine, right? (Just go along with me on this one.) Moving right along… while I was at the farmers market I saw these fantastic Mediterranean cucumbers and French Breakfast radishes and just had to grab them. 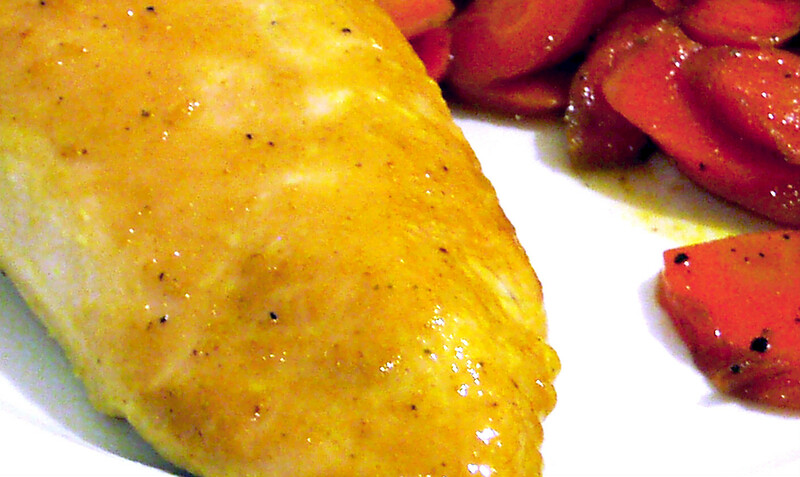 To make this recipe you do not need fancy-pants produce. I decided to write the recipe based on what I bought, but you could also substitute with an English Cucumber and a bunch of radishes at the grocery store. The salad will still turn out well, and will probably cost you less then what I paid at my beloved farmers market. 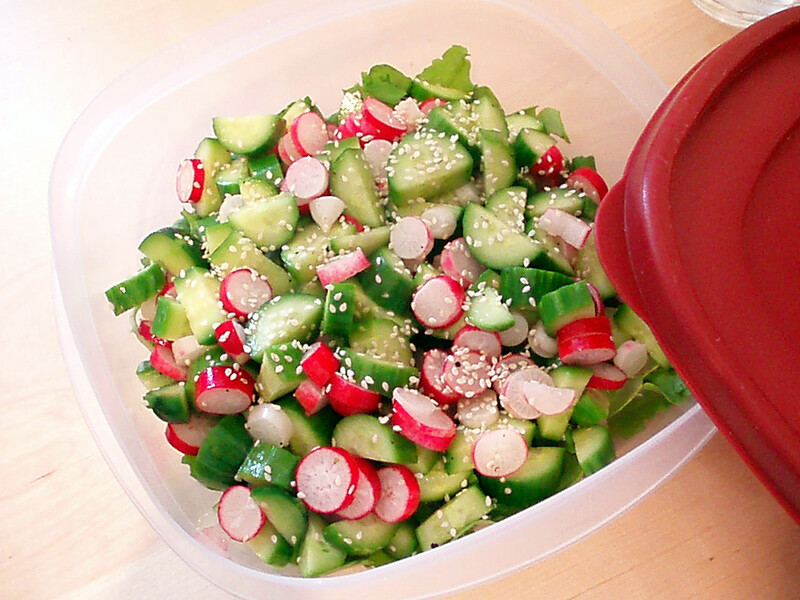 Wash the cucumbers and the radishes and then dry. Don’t skip this step… radishes are a root vegetable and are guaranteed to still have dirt on them. In a small bowl combine the rice wine vinegar, sesame oil, canola oil, salt and pepper. Stir well with a fork to mix. I also added a pinch of mustard powder to help the dressing emulsify, this is optional. Cut the cucumbers in half along the length and then into ¼-½ inch pieces. Place them in a medium bowl. Remove the radishes from the stems and greens (set these aside) as well as any stringy parts at the tips. Cut the radishes into ¼ inch slices. Add to the cucumbers. Add the dressing to the cukes and radishes and mix well. Cut the greens off of the stems and lay out on the bottom of your serving dish. Pour the salad on top of the radish greens. Sprinkle with sesame seeds if you have them (don’t buy them just for this, seriously), serve and enjoy! Wash the carrots and cut them into ¼ inch thick slices along a diagonal. 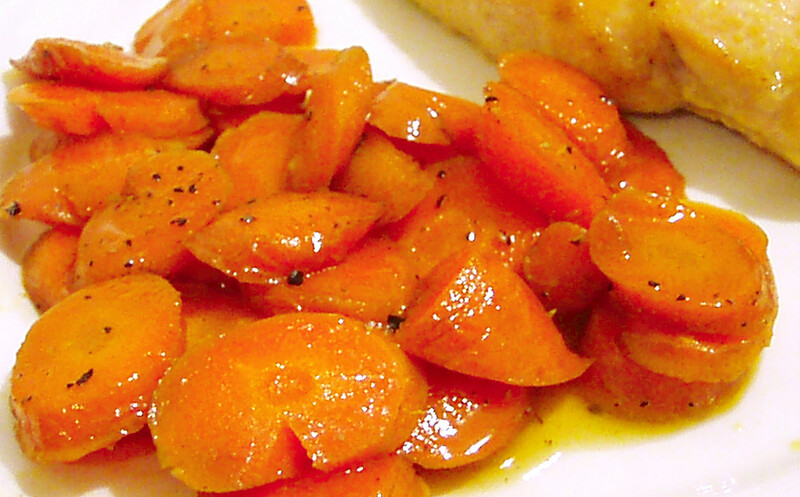 In a large pan (with a lid) combine the carrots, syrup, butter, water, salt and pepper. Place on a burner on medium-high heat and cook until the butter is melted and the liquid starts to bubble. Stir well and reduce heat to medium-low. Partially cover the pan and cook the carrots for about 15 minutes or until the liquid has reduced down to a thick glaze. Spring is here! The birds are chirping, the trees are budding and the daffodils are out in full force. I will also add that the temperature here in DC has been perfect these last few days. 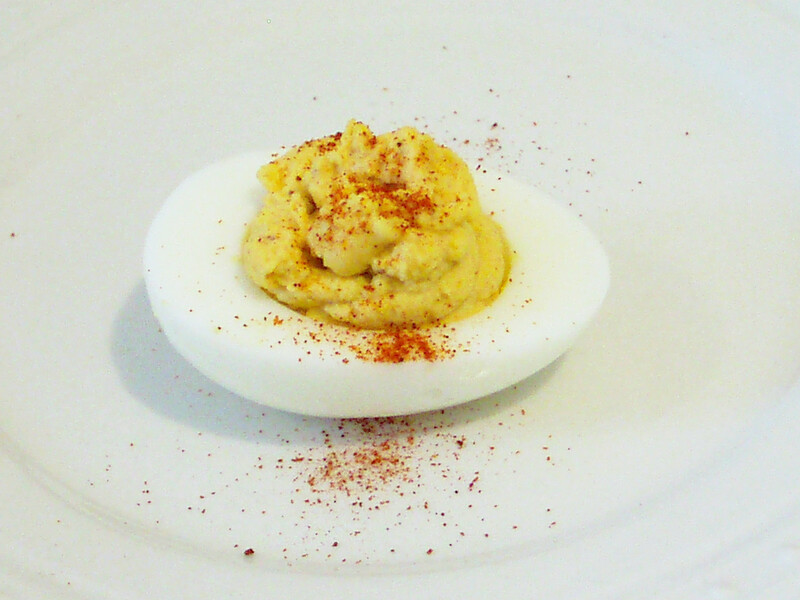 So what better way than to celebrate the start of Spring with deviled eggs? Eggs, for those of you who do not know, are considered one of the most iconic symbols of spring. It’s why they’re dyed and hunted for this time of year, and why they pop up on a Seder plate. I also like that deviled eggs are a vehicle for my favorite thing: horseradish. I am not a big egg person. In fact, most forms of cooked eggs gross me out a bit. But the flavors (aka the horseradish) make deviled eggs enjoyable to me. Aside from aiding me in consuming absurd amounts of horseradish, deviled eggs also make a quick and easy appetizer any time you need to bring something to a party or are hosting yourself. Deviled eggs are also easy to make any time. You can boil the eggs in the morning, and then whip up the filling later in the day. Place six eggs in a saucepan and cover with water until the water is about 1 inch higher then the eggs. Place on a burner on high heat and bring to a boil. Once boiling turn off the heat, cover, and let sit for 17 minutes. After 17 minutes carefully transfer the eggs to a bowl of cold water and allow the eggs to cool for at least 10-15 minutes. Carefully peel the shells off the eggs and discard. Cut the eggs in half the long way, and set aside on a plate. Not sure what the heck I am talking about? Look at the picture again. Add to the yolks the mayo, mustard, horseradish, salt, pepper, and a pinch of paprika. Stir well with a fork until the mixture is smooth. If you think it needs more of any of the seasonings feel free to add until it tastes just how you want it, just be sure to add small amounts at a time. Carefully spoon the yolk mixture back into each egg. If you want to go for stellar presentation you can place the yolks in a plastic bag, seal it shut, cut off about ¼ inch from a corner and pipe the yolks into the eggs. Sprinkle each egg with a little paprika, serve and enjoy! I spent my 20th birthday in Ireland, which was one of my better birthdays (I have spent birthdays in so many weird middle-of-nowhere type places just being in a city was a big deal). I was studying abroad in London at the time and took a long weekend with my classmates to Dublin to explore the city. The trip was a blast. I remember that during the weekend Harry Potter and the Half-Blood Prince was released, so I spent my last hours in Dublin with my head buried in a book eating away at a loaf of soda bread I had bought at a bakery that morning. I’m quite the cultural tourist. 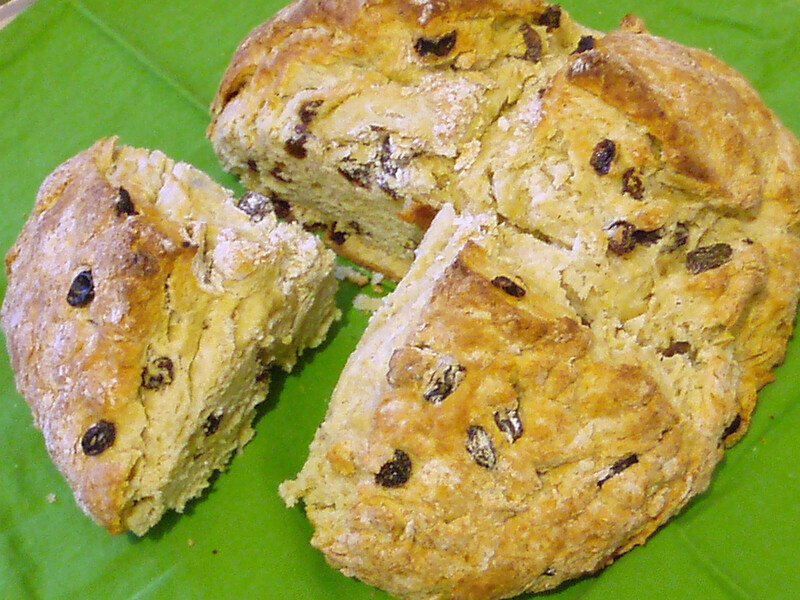 This St. Patrick’s Day I decided to draw from my time and make some soda bread. No corned beef and cabbage this year, though I did buy a corned beef brisket on sale at Safeway that is now residing happily in my freezer until the time is right. I plan on eating this bread for the rest of the week, and enjoying every bite of it. In a large bowl stir together the flour, sugar, salt and baking soda. Cut the butter into small pieces and add to the bowl. Work the butter and flour mixture with forks until it looks like a coarse meal. If you aren’t sure what that looks like, just stir it for about 3-5 minutes. Stir the raisins into the bowl. Pour the milk into a measuring cup, and the egg and beat until the yolk is broken. Add the milk and egg to the bowl and stir with a wooden spoon until dough is too stiff to stir. Flour your hands and gently knead the dough in the bowl until it forms a ball shape. Be careful not to over-knead the dough as it will become tough. Place the dough on a greased baking sheet and cut an “x” across the top about 1½ inch thick with a serrated knife. Bake in the oven for 35-45 minutes or until the bread is golden and a knife inserted in the middle comes out clean. Allow bread to cool on the baking sheet for 5-10 minutes and then transfer to a plate to cool further if needed.